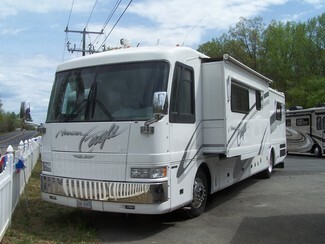 This unit is the 2000 Fleetwood American Eagle. It is forty feet long and more than enough room for everyone with its seating for eight. It has leather upholstery and a carpeted floor in the living area. It has Corian countertops and a tile floor in the kitchen and hallway. The kitchen has a double compartment sink, an oven, a microwave, and a refrigerator/freezer with double doors. As you can see, it has lots of mirrored cabinet space and a very spacious angled shower, vanity, and enclosed bathroom. There is a television in the cockpit between the driver and passenger seats and another television in the master bedroom.